This year (2013) we have grown caliente mustard as a green manure on the plot first, planted the potatoes in amongst the mustard, and then when the potatoes started growing we have cut back the mustard, chopped up the leaves and buried them in the soil that we have heaped up around the potatoes. 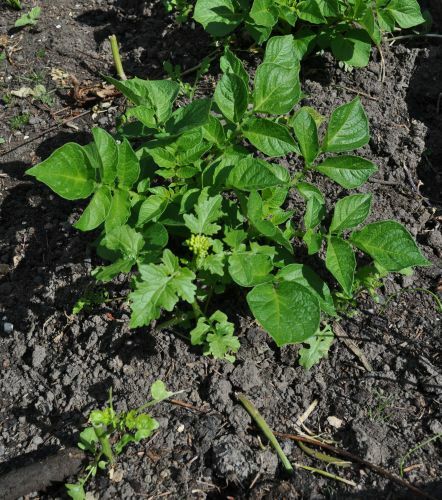 Caliente mustard is a bio-fumigant and we hope that it will help to reduce any potato pests along with helping to condition the soil. This year we are trying Lady Christl (first early), International Kidney (second early) and Sarpo Mira (main crop). Sarpo (pronounced sharpo) Mira is very resistant to blight, a fungal disease that affects potatoes and is also resistant to wireworms, slugs, viruses and drought. This is a potato that has been developed by the Sárvári Research Trust (SRT), which is a not-for-profit company based at Bangnor university in North Wales. Alys Fowler likes them so they must be good!